The first week of September was chock full of markets, and this weekend feels a bit slower. My advice would be to check the status of the Ebisu Market, too. It may have cropped up on the calendar since this post was scheduled. That's always a fun one in a nifty part of town. Otherwise, head on out to explore and see what vegetable adventures there are to be had! 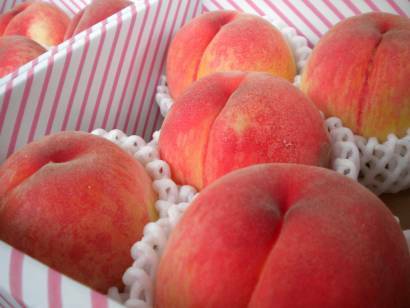 Today's photo is from our trip to the Fuji Five Lakes in July, and has my mouth watering at the memory of those lovely peaches. Wasteful as they are, I do find their little styrofoam sweaters rather cute, too.